This column, putting forward a brilliant theory of mine about the bogus reason why a disturbing number of people may think LCDs are better than CRTs, attracted a bit of comment. A representative sample of the e-mails I got, and the answers I sent, follows. To clarify - my point wasn't that CRTs are better than LCDs. It was that people who are used to 60Hz-refresh-rate CRTs, and don't know they can improve them, will think a flickerless LCD looks like heaven. You missed an important point (to me, at least) in your column. LCDs don't produce radiation like typical CRTs do. Sure, CRTs are shielded, but I doubt it's 100% effective. In my work area, I have two monitors that face me directly, and the backs of my neighbors monitors also face me (are these things properly shielded from the back?). So take what some government agency says is a safe amount of radiation for me, multiply it by four, and then ten hours a day for years and years. I always bought expensive CRT displays because I was finicky about quality. Now that I've tried LCDs, I'd never switch back. (and yes, I know how to set a refresh rate :-). Yes, you are being exposed to electro-magnetic radiation. This radiation has not, however, been shown to do anything bad to humans. Some people who work near lots of monitors get ghastly diseases, sure, but they don't seem to get them any more often than socio-economically equivalent people doing the same sort of stuff but with less exposure to electro-magnetic radiation. Now, that doesn't mean it's dumb to reduce your EMR exposure; being worried about EMR is not like being worried about attack by tiny goblins who live in desk drawers. But there's no reason to get particularly hot and bothered about it. I ramble on about this a bit at the start of this column. Something you don't mention in your column is that LCDs have perfect convergence, whereas many CRTs, even very expensive CRTs, have terrible convergence. The Sony monitor on my desk at work, while otherwise very nice, has pretty bad convergence overall, with a misconvergence of a few millimeters in the lower right corner. And that's at the best adjustment possible with the available controls. That's why I get eyestrain from many CRTs and not from LCDs. A not-very-good CRT, or one that's trying to deal with a local magnetic field that's managing to affect the electron beams differently, may have a convergence error of more than a millimetre on one or more corners, when you view a convergence test pattern like this or this. Good CRT monitors should have pretty much bang-on convergence corner to corner, though. My cheapo Samsung 19 inchers are fine in this department, though there's a little brightness drop-off in the corners. It's possible part of your monitor's metalwork is magnetised; it's also possible that someone just dropped it. The bigger the tube, the harder it gets to keep everything lined up. Quality 21 inch CRTs like yours really ought to be no worse than cheap 19s like mine, though. A CRT has a much more reflective quality than an LCD screen. This means that the eye will focus on objects reflected in the CRT subconciously and conciously all the time. Do you realize that to a certain degree you can see yourself and object behind you in your CRT? This is most noticeable on a black background. As a test, set a black background, wave your arms in front of both monitors and see the difference. Depending on the size of the room you are in, focus on the reflection of something behind you in the monitor, and then focus on some text on the screen. Do this repeatedly and you'll understand how eyes get tired. Of course you'll probably tell me about the anti-reflective coating :) But not many people use add-on anti-glare screens. Although they would be cheaper than buying an LCD, you also lose some brightness and clarity with them. I don't think there's any particular difference in reflectivity between LCDs and similarly flat CRTs. There are different anti-reflective coatings, but all desktop monitors have glass fronts with similar basic reflectivity, as far as I know. I don't have reflection problems with my CRTs, because I don't set my monitors up somewhere where the background, or I, am illuminated. Sometimes this is unavoidable, of course, and as I type this it's the morning here in Australia and I really ought to close the skylight blind to stop myself from seeing the workbench on the other side of the room reflected in the screen. But a correctly set up monitor shouldn't have anything it can reflect at you. It's easier to achieve this with flat-fronted monitors than with curvy ones. After reading your article on LCDs I thought I'd send you a note regarding my personal experiences, and how I've reached a slightly different conclusion then you did. I have a Cornea CT1810 18.1" LCD. Before I had it, I had a 19" "Cybervision" monitor. I ran the Cybervision monitor at around 85 or 90Hz. The monitor had issues, though - after a few years of using it, the radiation it put out caused a large number of dust particles to be permanently fused to the wall behind it. While this makes a good conversation piece, it worried me about what was going into my face. - The LCD is bright as hell. Brighter than my CRT. - The "slowness" of the LCD (note: games are fine, I don't see any lag). - Having a monitor at a different elevation and angle. - The change in resolution. - Switching from a bulbous CRT to a completely flat panel. I'm still not sure. Now that the eyestrain is gone, I've found that I can work at the LCD far longer than I ever could at the CRT. I suppose I'm writing this to you because I want to let you know that there is something other than the increased refresh rate that makes LCDs nicer. I'm not sure what it is, but there's something. It's not the "cool new toy" factor, either - if I were worried about that, I'd have saved myself the cash and bought a CRT, which would have allowed me to upgrade my video card (I still have a GeForce2 Ultra). You definitely have a valid point about the increased refresh rate for inexperienced users - but as to how much this contributes to the experience... I don't know. The gunk wasn't "fused to the wall" by radiation; it was just ionised air. Monitors, and some other devices with highly charged devices in them like photocopiers and laser printers, spit positive ions from their ventilation slots. Positive ions are alleged to make you feel lousy; negative ions are alleged to make you feel good; both kinds make dust particles clump together and stick to nearby surfaces. Older monitors produce more positive ions than newer ones. What's going into your face? Not much of anything, really, from your own monitor at least. The electrons hitting the inside of the tube create X-ray radiation, but the tube is made of leaded glass which absorbs functionally all of it. Lots of people have strange ideas about what various emanations from their electronic equipment may be doing to them, but there's no good evidence to support the idea that monitor EMR is harmful. In any case, practically all of it is emitted out the back of the tube; people like Anthony who have monitor-backs pointed at them may have grounds for more alarm, particularly if the monitors are elderly. High screen brightness is a proven cause of eyestrain. Monitors shouldn't actually be any brighter than necessary to cope with ambient light, but winding down the brightness of many LCDs means lots of dark tones collapse into black, and further hurts the screen's already not-so-great contrast ratio. So you have to run 'em bright. My CRTs' brightness is often set to zero. Generally speaking I find your articles thoroughly well-informed and utterly BS-less, which is why I keep coming back to your site. This one, though, struck me as having been written by someone who perhaps only passingly tried an LCD screen once at a friend's house, or while browsing through an electronics store display, or during some other fleeting moment in time. It certainly didn't strike me as being written by someone who's actually used one of the things on a regular basis, who's come to know an LCD's charms through experience rather than through reading message board and Usenet postings about them. For one, there's more to image quality than contrast ratio, which I'll grand you CRTs still have over LCD's (though the gap is closing). I'm sitting here at work right now on a fairly good, $600+ Trinitron CRT and I almost feel drunk, the image is so blurry compared to my screen at home. Perfect geometry is not the only positive side effect of hardware pixels - absolute, 100% sharpness is another. Some people find images displayed on an LCD screen harsh, but the fact is they're closer to rendering the true digital image as specified in the data it contains (whether it be a photograph, a graphic, or a font) than a CRT will ever be, flaws and all. I even find my LCD screen valuable for design work for this reason (though color accuracy is always a concern, but not so much with the latest models), because it allows me to see and correct compression artifacts in greater detail and with greater clarity than I'd ever get on a CRT. I will agree with you that LCD's are more idiot-proof than CRT's - but I'm not sure how this is a failing of LCD technology. Rather, I see it as the other way around. If we can accept that it's arguable which technology provides an overall superior picture (CRTs provide greater contrast, LCDs provide greater sharpness and better geometry), then why can't we accept that the technology that providers the best picture the easiest for the greatest number of people is the superior technology? Is that not logical? When the remaining advantages of the LCD are taken into account - size, weight, power consumption, heat - then it seems to me the LCD is simply an evolution in screen technology rather than an "alternative" technology to the CRT. It will not be the final evolution - there are other potentially superior technologies out there that have yet to be mass marketed - but it is a logical step beyond the CRT, which will eventually meet the same fate as the dot matrix printer, the 5 1/4" floppy and the CD caddy. I use an LCD every time I use my laptop. I've also reviewed a fair few of them. I still haven't been very tempted to pay for one, though I'd take one for free! 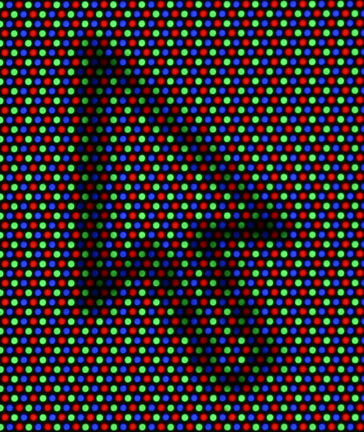 CRTs are, inescapably, blurrier than LCDs, because LCDs have a hard pixel grid and CRTs just have a field of phosphor dots (or stripes, in the case of aperture grille tubes like your Sony's Trinitron) on which the pixels fall as they may. I don't know, however, what's so great about being able to see the shape of your pixels. I don't want to be able to see the stair-steps on the edges of curved letters. Isn't that what LCD users turn on subpixel rendering to avoid? CAD people, as you say, like LCDs, because it's a bugger getting proper straight lines out of anything else. People doing print design work prefer CRTs, though. I didn't say that LCDs' idiot-proofness was a failing. I just said that if low refresh rate is your problem, then raising it is a better solution than buying a new screen. If money is no object, then sure, LCDs are better for most people. But CRTs are still much cheaper. If and when LCDs achieve price parity, they'll be a clearly better choice for a large majority of computer users. Doesn't LCDs' lack of refresh rate takes tearing [explained in a somewhat different context here...] out of 3D games. LCDs don't cure tearing. Just turn on vertical sync and nothing will exhibit tearing. LCD screens certainly can display tearing, quite badly, thanks to the 60Hz input signal that's all that many of them can handle. They don't flicker, but they're only being sent 60 full frames per second; that's the maximum frame rate you can possibly get with vsync on. The signal rate doesn't go up with vsync off, but you can see part of one frame and part of another on the one refresh; that's what "tearing" is. The lower the signal frame rate, the more noticeable this is likely to be. Signal frame rates don't come any lower than 60Hz, unless you put your modern PC away and break out the old Amiga. I believe that you left out one very important aspect to the eyestrain issue in your article. It has to do with the eye's ability to focus on the CRT. Some people still have problems, even after a CRT's resolution and refresh settings are set correctly. The usual solution is to prescribe a pair of glasses that prevent the user from focusing precisely on the surface of the CRT. This is necessary because every CRT is not a precisely flat visual surface, like a piece of paper; rather, a CRT is composed of red, green and blue dots, arranged in threes, that are physically at three different depths beneath the glass surface of the CRT. This forces the eye to "hunt" for a solid focus point (which it will never find), thereby forcing constant focusing corrections, resulting in eyestrain. This is why an ophthalmologist or optometrist will prescribe glasses that prevent focusing on that plane in the CRT, which reduces the "focus hunting", hence relieving eyestrain. 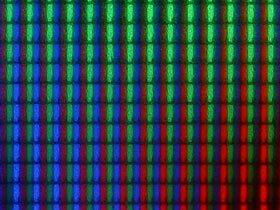 In LCD flat panel displays the color pixels are all on the exact same physical plane. Therefore, the eye has no problem focusing on the panel, and it is for this reason LCDs are easier on the eyes overall, despite the viewing-angle issues and the other issues you mentioned. Another negative to LCDs is their inability to display "blended" colors or gradients: you get pixelation and color banding because the LCD can't modulate each pixel, it's either ON or OFF, and that's that. CRTs can modulate each pixel's intensity, thereby enabling smoother color transitions. I'm not sure where you're getting the different-phosphor-dot-depth idea from. 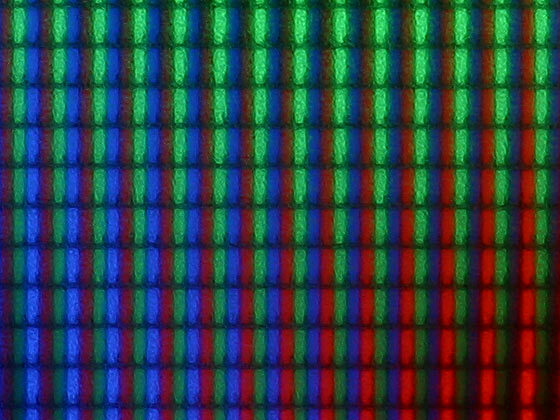 I was under the impression that the phosphor layer was flat - or as flat as the inside of the monitor glass, anyway. In any case, the dots on the screen, no matter what their depth, are by definition too small for the unaided eye to see at normal viewing distances. If you've got OK vision, you can just pick them out if your face is a few inches from the screen, but you need a jeweller's loupe to see them properly. When I've photographed monitors and looked at them under magnification, I've noticed no difference in depth between the dots, and had no trouble focussing on them all at once, despite the miserable depth of field of the high-magnification optics. Without magnification, at normal distances, I've never seen the dots at all. ...have no trouble modulating the brightness of their pixels to the full 256-levels-per-colour extent needed for 24 bit colour.